Given the importance to the role of reading about the development of science then there should be efforts to improve students’ reading ability by using the presence of English comics as a medium is expected to make a positive contribution for students through its nature that makes readers are happy. The child’s interest in the story tells a significant emphasis about the need through the use of comic media for learning. This classroom action research aims to improve students’ reading comprehension at VIII C in MTs Subulussalam Kayuagung through English comic media. This research is a Classroom Action Research which is carried out by following John Elliot's model research procedure which includes planning, action, observation, reflection or evaluation. The research was conducted at MTs Subulussalam Kayuagung from the 2017-2018 which was odd semester of 26 students. The research shows that before being given instruction using english comic media the average score of reading student’s understanding is 62,70 (57,70%) with medium category. After reading comprehension learning using english comic media first cycle the average score of students’ comprehension ability increased to 70 (69.23%) still in medium category and done learning on second cycle of reading comprehension ability of student experience increase of average value and percentage equal to 81,54 (88,46%) with very high category. Arikunto, S. (2009). Penelitian tindakan kelas. Jakarta: Bumi Aksara. Iskandar. (2012). Penelitian tindakan kelas. Jakarta: Referensi (GP Press Group). Prasetyono, A.E., Amsia, A., & Ekwandari, Y.S. (2015). Pengaruh penggunaan media komik terhadap peningkatan hasil belajar sejarah. 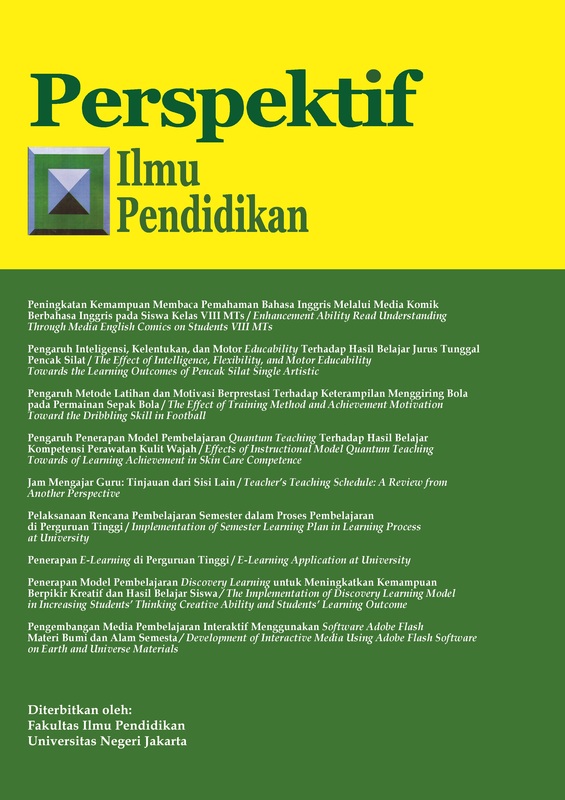 PESAGI (Jurnal Pendidikan dan Penelitian Sejarah), 3(6). Rubin, D. (2011). A practical approach to teach reading. Boston: Allyn dan Bacon. McCloud, S. (2001). Understanding comics. Jakarta: Kepustakaan Populer Gramedia. McCloud, Scout. (2008). Reinventing comics. Jakarta: Kepustakaan Populer Gramedia. Somadayo, Samsu. (2011). Strategi dan teknik pembelajaran membaca. Yogyakarta: Graha Ilmu. Suci, Lestari. (2009). Media komik. Jakarta: Universitas Pendidikan Indonesia. Yunus, Abidin. (2012). Pembelajaran membaca berbasis pendidikan karakter. Bandung: PT. Refika Aditama.